Well life has settled back to normal a few weeks down the track, after our brief but enjoyable visit to Indonesia. As promised, I have put together a post of the highlights (and the odd low-light) should you ever wish to venture over. Although this was our fifth visit to Bali, it was my first as a vegetarian and just like in Australia, some cafés/restaurants had excellent options for vegetarians, while others had slim pickings. Virtually all dishes would need to be modified slightly for Vegan diets. The great thing about the hospitality industry in Indonesia, is that they really love to keep their customers happy and won’t be offended if you wish to leave something out of a dish or add something else in. 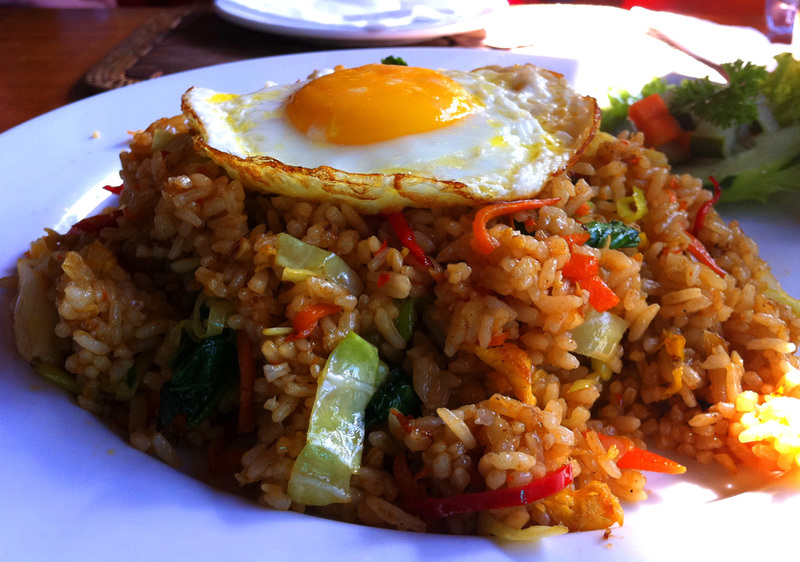 One dish I could always count on being on the menu was Nasi Goreng (Indonesian fried rice). The vegetarian version comes chock full of tasty tender-crisp vegetables and an optional fried egg on top. 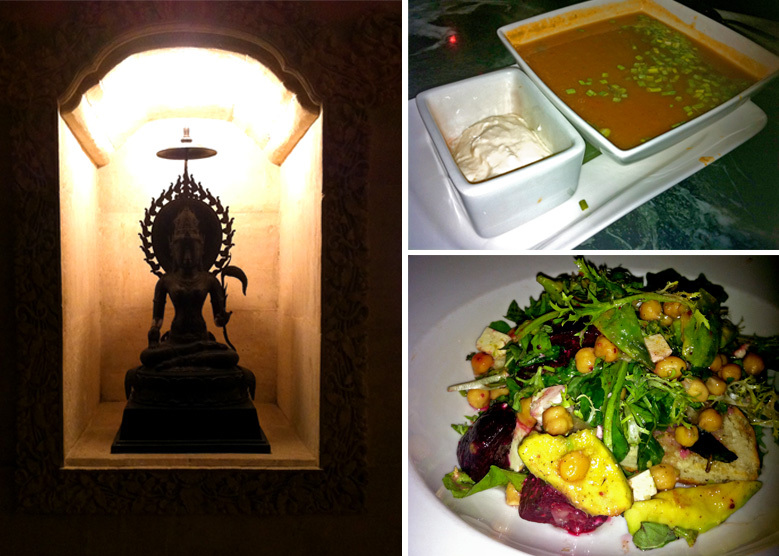 In our little party of four, I was the only vegetarian, so in Bali none of our meals were at restaurants serving purely vegetarian fare. There were some pleasant surprises along the way which I expand on below. On Bianco’s website they mention that they are the first known Indonesian/Italian restaurant in Bali and I guess with a name like Bianco there had to be an Italian influence somewhere! For the veggies as with most places, the Indonesian options proved the most friendly and didn’t rely solely on cheese and eggs to provide the protein source. We chose to sit out on the balcony where you can watch the world go by and enjoy the balmy breezes. For entrée I couldn’t go past the vegetarian spring rolls, which may sound a bit pedestrian, but I have to tell you, these were among the best I have EVER eaten. The rolls were filled with an abundance of veggies and great flavours and the pastry was delicately crispy without a hint of sogginess. 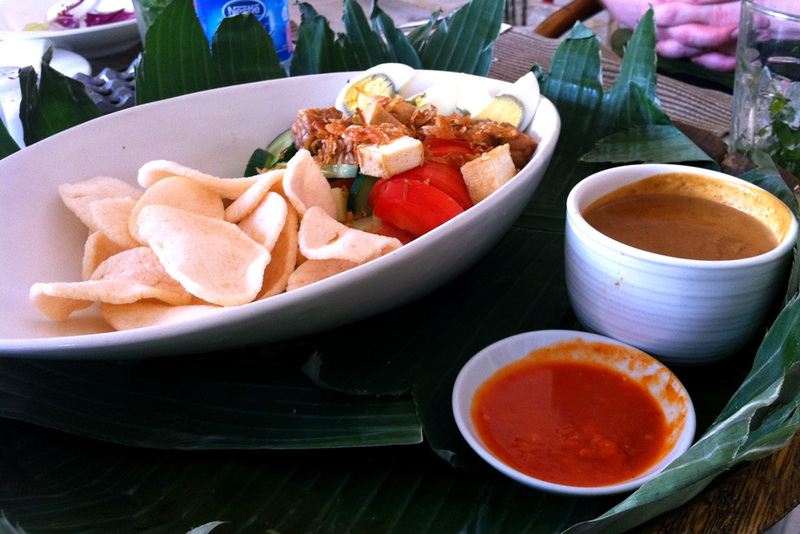 For my mains I was served up a very delicious Gado Gado, which is pretty much a salad consisting of raw and cooked vegetables with a boiled egg and tofu, albeit with prawn crackers; these were hastily removed from my plate by my dining companions! This came with a very tasty satay sauce and another smaller bowl of chilli sauce to up the heat if required. With great staff and located just a short walk from Kuta Beach, Bianco was a lovely escape from the heat of the day. 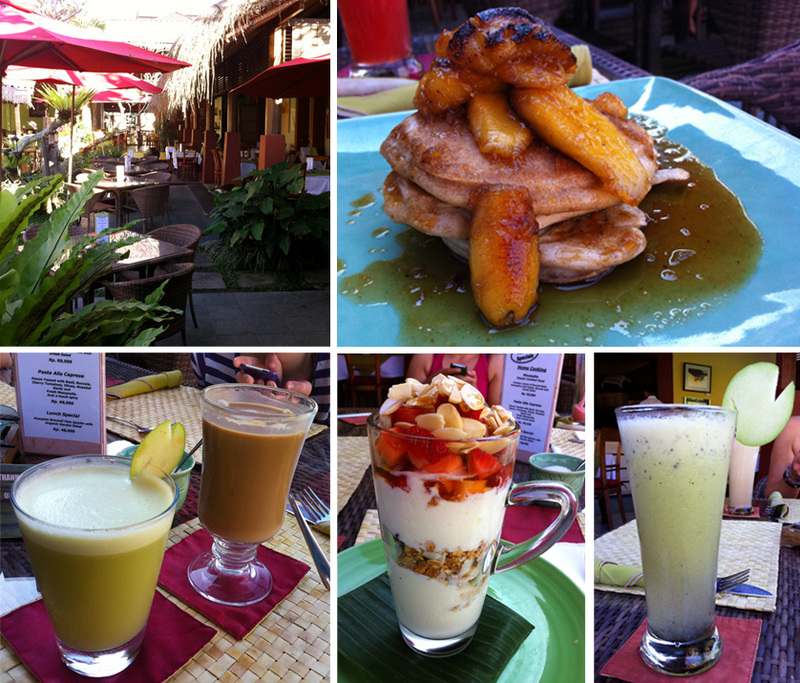 So, no trip to Ubud could be complete without a breakfast at Indus. This time around we all chose the very indulgent French Toast, bursting with the flavours of banana, cinnamon, spice and all things nice, complimented by a side serve of natural yogurt and maple syrup. 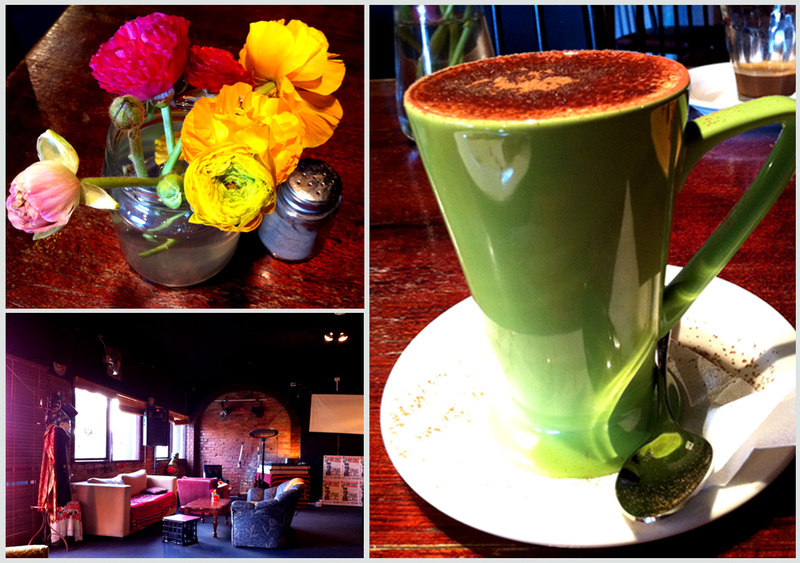 They unfortunately didn’t offer soy milk so I was unable to partake in my usual latte. I did however go for an Avocado Juice – if you haven’t tried this before you will be amazed (and possibly addicted)! It isn’t technically a juice as such, probably closer to a smoothie or milkshake if anything. The avocado is usually blended with milk (this would work well with rice, soy or nut milk too), a dash of sugar syrup and sometimes chocolate as well. It wasn’t a good time of year for avocados in Bali, so while still very drinkable, the avocado juices of this trip were not quite as mind-blowing as usual. 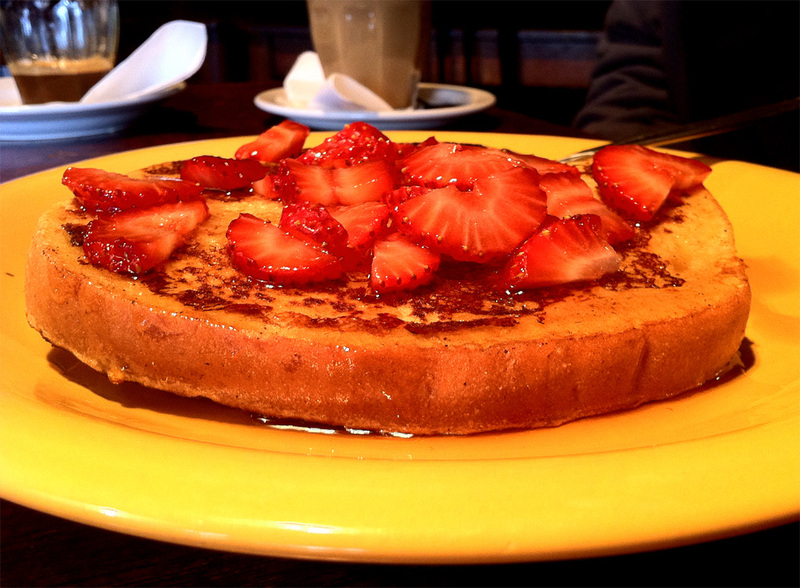 We have only ever had breakfast at Indus, but I have heard mixed reviews about the dinner menu. The restaurant has a lovely atmosphere and is worth a visit just to check out the glorious views. Cinta Grill, was quite a favourite on our last trip to Bali in particular for their daily Mojito happy hours! On this visit to Cinta I wasn’t overly hungry, just in need of a couple of snacky things to see me through the evening. There is a fairly substantial selection of vegetarian meals to choose from on the menu here, but I turned straight to the starters. First pick was the Vegetarian Samosas with Tamarind Chutney. A fairly stock standard samosa, nicely cooked with the chutney providing a good tang to cut through the starchiness of the potato in the filling. The Fresh Rice Paper Rolls with Thai Herb Dipping Sauce on the other hand were amazing and unlike any others I have eaten in the past. The emphasis on these was definitely the mint, and lots of leafy greens which was extremely refreshing on the palate, however if mint is not your thing I would probably give them a miss! The Mojito happy hour was still in full swing although this bar and many others in Bali have taken to using lime cordial instead of fresh lime juice in their Mojitos making them cloyingly sweet and not so refreshing. After the first round we asked if juice could be used instead of cordial and they were happy to oblige, so no complaints here. I’m guessing most of their customers prefer the cordial over the real thing hence the change in ingredients. Hot and bothered after walking around the streets of Ubud and very much in need of some drinks and a light meal to keep us going, we literally stumbled upon Clear Café with its impressive facade and pile of shoes at the front door. 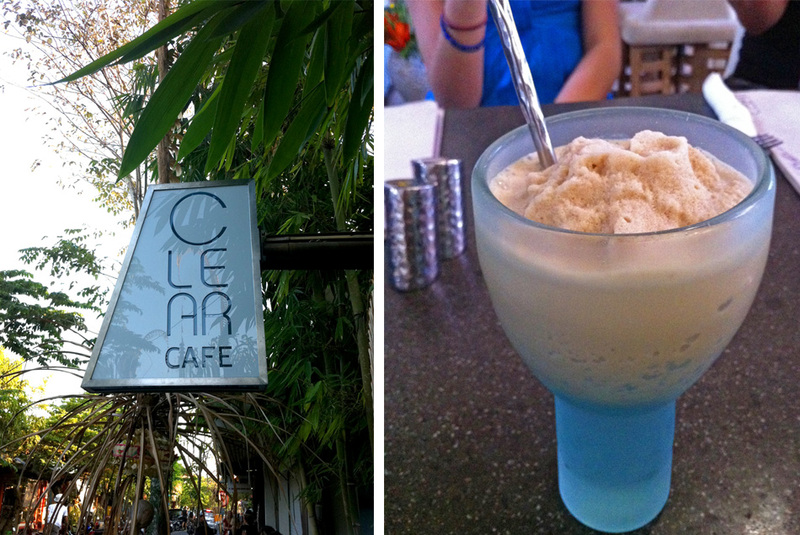 Clear Café is a very unusual eatery in Bali both in terms of decor and cuisine. Focusing on Organic, Raw, Vegan and Seafood, it has a “shoes-off inside” policy and a very modern eco style. I’m thinking a lot of money was spent on the fit-out and the table wear (check out the glasses!). Unfortunately, I wasn’t feeling too crash hot the day we visited so I didn’t take as many shots as I would have liked, but you can check out the gallery on Clear Café’s website for a closer look at the gorgeous interior. A good ice coffee is hard to find in most places, but even more so in Bali; usually its just a tall glass of cold black coffee with a few ice-cubes thrown in for good measure! Clear Cafe have an impressive array of refreshing drinks on offer and a substantial selection made with Mylk (a cashew nut milk extracted from locally grown produce). I wish there had been more time so I could work my way down the menu! As I was craving coffee (and something cool) I went for a Mocha Shake made with Mylk which was ice-cold and absolutely delicious! We also ordered a plate of Majestic Mushrooms which were pleasant enough although probably a little too cheesy. The Indo Spring Rolls with tofu, would have been great if they hadn’t been covered with the very over powering tamarind “dipping” sauce. It was very sour and in need of some sweetness for balance; this would have been much better served to the side as the menu suggested. Top marks for presentation, all the same! Although we weren’t blown away with the two dishes we ordered, Clear Café would have to be one of the most vegan friendly and innovative restaurants I have encountered in Indonesia. 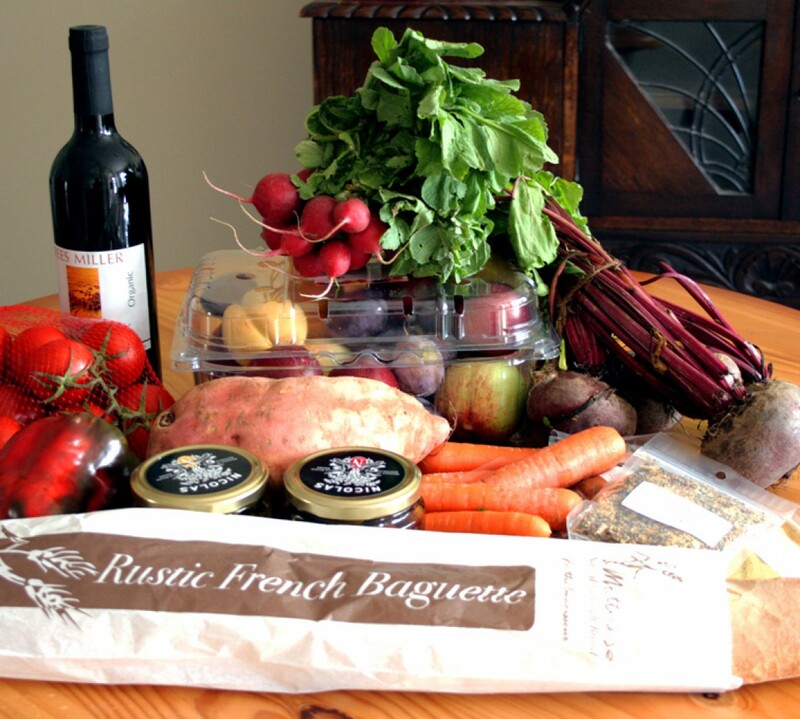 Take a look at their menu; it really does have the potential for some fabulous meals. Casa Luna comes in at No.3 on Lonely Planet’s 138 things to do in Ubud. Run by Australian expat Janet DeNeefe and her Balinese husband Ketut Suardana, it has topped many lists over the years and is just one part of a mini empire in Ubud which includes Indus Restaurant (of the french toast fame, above), a Cooking School, Guesthouse and Emporium. 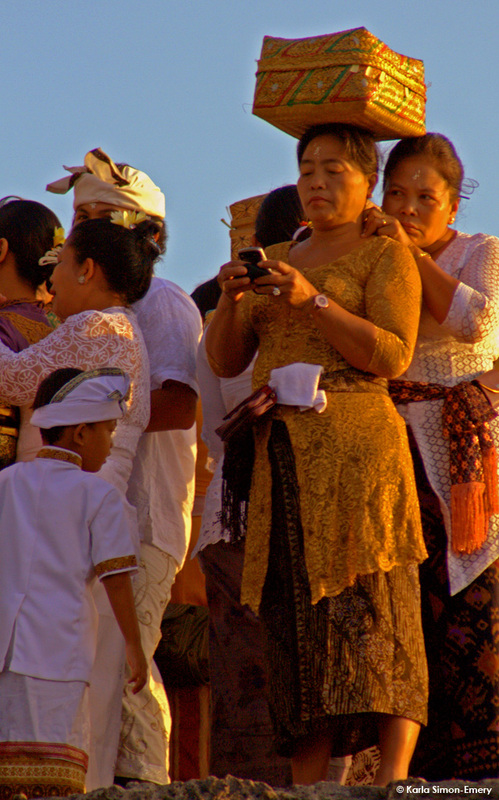 Janet is also author of the memoir Fragrant Rice which chronicles her love affair with Bali. On previous trips to Ubud, we have frequented Casa Luna for leisurely lunches and avocado juices while on the way to someplace else. This time, we decided on a visit for dinner and unfortunately we were all a little disappointed with the meals we ordered. My pumpkin soup was under-seasoned and lack lustre, with the chickpea, beetroot and avocado salad being rather bland and weighed down by soggy croutons. My fellow diners had similar gripes with their meaty orders so this time around Casa Luna didn’t rate highly at all for me. Three Monkeys was recommended to us by a friend via facebook, so we were keen to try it out for breakfast one beautiful morning. From the front the cafe looks quite cosy but on walking through you enter a very inviting and substantial alfresco area along side rice paddies – just lovely! The variety of fresh juices were abundant and delicious with suggested combinations or could be made to order. I had my favourite blend of fresh apple juice with a good dose of ginger – just the thing to awaken the senses first thing in the morning. I also couldn’t resist ordering a latte and it turned out to be a very satisfying one. Three of us ordered the buckwheat pancakes with bananas and syrup but these were sadly not up to scratch, although they looked very appealing. The batter was very dry, powdery and tasted strangely like camphor…these were all returned to the kitchen and the staff cheerfully replaced them with something else off the menu. I went for the yogurt, muesli and fruit combo which was bursting with flavour and goodness. All in all a good experience and I would definitely give it another go on our next trip. Stay tuned for the Java roundup to follow soon! On a gloriously sunny Saturday a couple of weekends ago, it was time to pay a visit to the not long opened Mister Nice Guy Café. Filled with comfy couches and the sounds of groovy retro tunes, the café is housed by day in the Noise Bar, at the Railway Hotel in Brunswick. Famous in the vegan community for their wonderful cupcakes, the cafe is quickly making a mark in its own right. Eager to taste the delicious looking french toast I saw on another bruncher’s table and also the baked apple and walnut crepes I’d heard so much about on their Facebook page, we ordered both to share, along with hot chocolate for me and soy flat white for Jayson. Interestingly, this is the first time where Jayson couldn’t order cow’s milk with his coffee, yet I could order anything off the menu – it was a wonderful bizarro world for me! Jayson was curious as to how they could make crepes and french toast sans eggs. 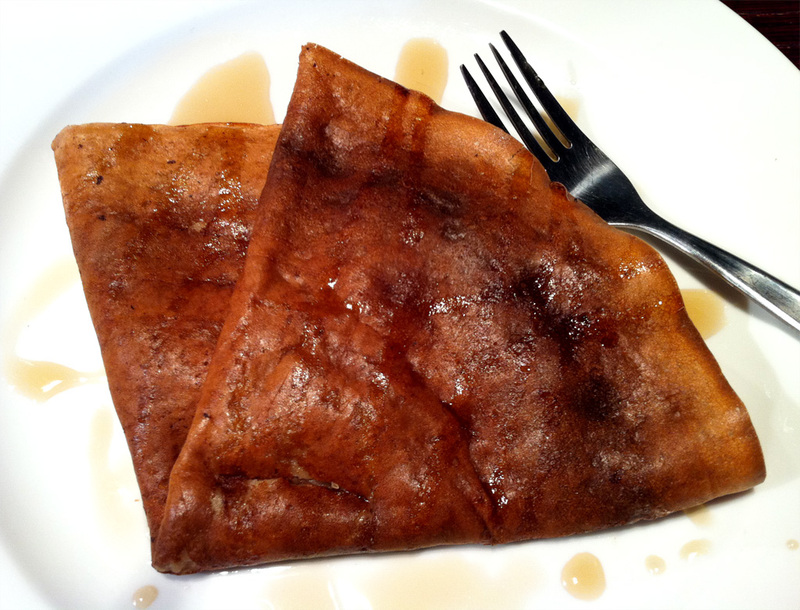 Turns out they are made with silken tofu and the eggs were definitely not missed here; while the crepes don’t look quite like conventional crepes, they are still light, fluffy and delicious. 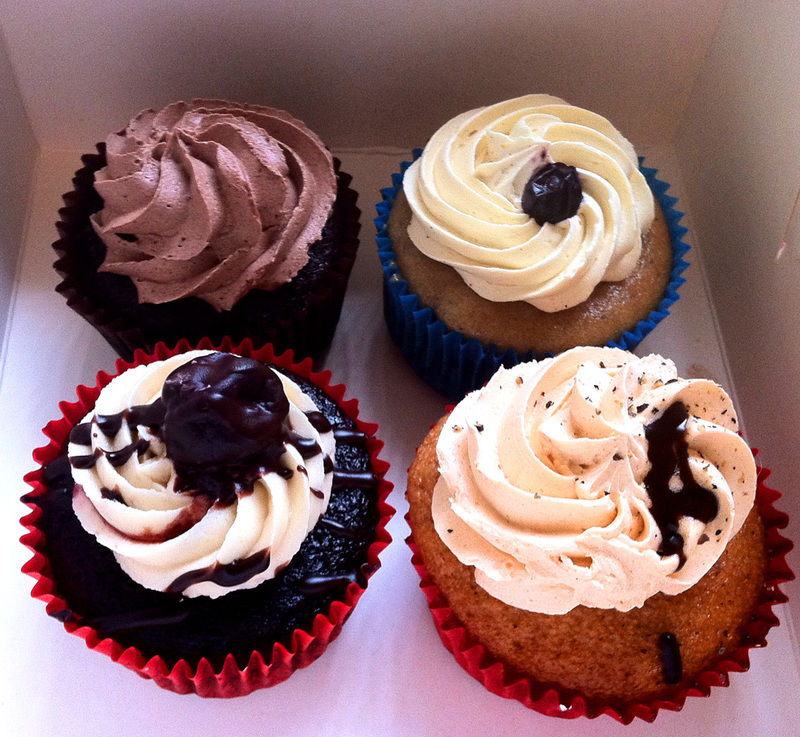 I was determined to try the vegan cupcakes I had heard so much about, but being full from brunch, we selected four to take home and munch on later. These were moist and delicious and every bit as good as their non-vegan counterparts. My favourite was the Cherry Bomb. So yummy! The cupcakes are also available from Radical Grocery Store and Las Vegan Nirvana Café, plus several other cafés as listed on their website. 291 Albert St, Brunswick (enter from the bike path side of the hotel near the railway line). A week or so ago I bought a bottle of not so great Vegan wine. Extremely dry, bordering on sour – just not to my taste (or Jayson’s) at all. While flicking through a Donna Hay magazine, I happened upon a recipe for Mulled Wine and got to thinking…perhaps I can improve on this undrinkable wine… and you know what? It was a HUGE improvement! The recipe is so simple I don’t even have to look back at the mag! Place all ingredients in a saucepan and heat gently to a simmer (do not boil as this will cook out the alcohol). Stir to dissolve sugar and combine ingredients. Cook for 5 minutes. 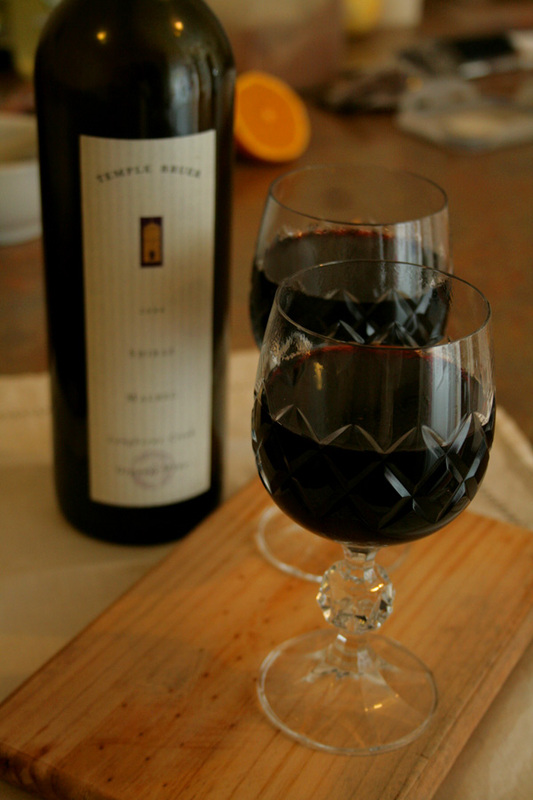 Strain and pour into glasses. Enjoy! 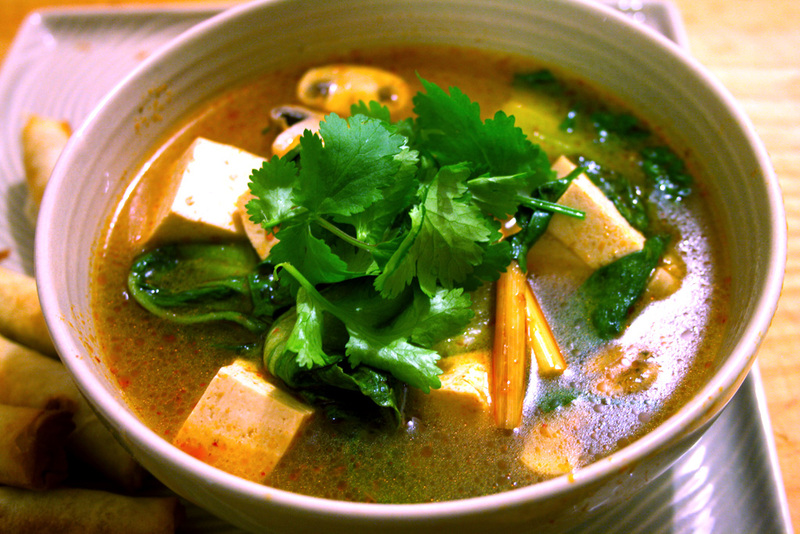 Tom Yum Soup – Yum indeed! After my last post about the unfortunate Thai restaurant experience (and still craving Tom Yum Soup), I was determined to make my own version in-house that still had the punch of flavour without the fish sauce. Soybean paste, as it turns out, acts as a wonderful substitute for the fish sauce, adding just the right amount of saltiness and pungency. A while back I made a Green Thai Curry with a vegan paste and found that it really lacked the depth of flavour you find with the fish sauce added varieties, and the addition of the soybean paste really made a huge difference to the flavour. Less is more though, just 1/2 to 1 teaspoon is often all that is needed to balance things out. This recipe came from what is turning out to be a great little book filled with little gems “Veggie Food“. I have made a few tweaks, with the addition of the soybean paste being one, but the basic recipe was pretty good to start with. Place stock, Tom Yum Paste, soybean paste, galangal, lemon grass, kaffir lime leaves, chill and an extra 3 cups of water in a saucepan. Cover and bring to the boil, then reduce heat and simmer for 5 minutes. Add the mushrooms and tofu and simmer for 5 minutes or until mushrooms are tender. Add the pak choi and simmer for another minute or until wilted. Remove pan from the heat and stir in the lime juice and coriander leaves before serving. This will provide 4-6 servings. Simple and relatively quick to prepare, yet very satisfying. Enjoy! Over the last five weeks I have been posting fairly infrequently and in that time I also fell off the Vegan wagon…but wait, there’s more…for a brief while I was pregnant for the first time in my life. As swiftly and surprisingly as pregnancy came, nine weeks later it was all over 😦 In truth, a developing embryo only resided within me for at best, four or five weeks. However my body continued to believe it was pregnant, by (a) continuing to grow an empty gestational sack and (b) serving up the most hideous morning sickness I could have imagined for a further four weeks. 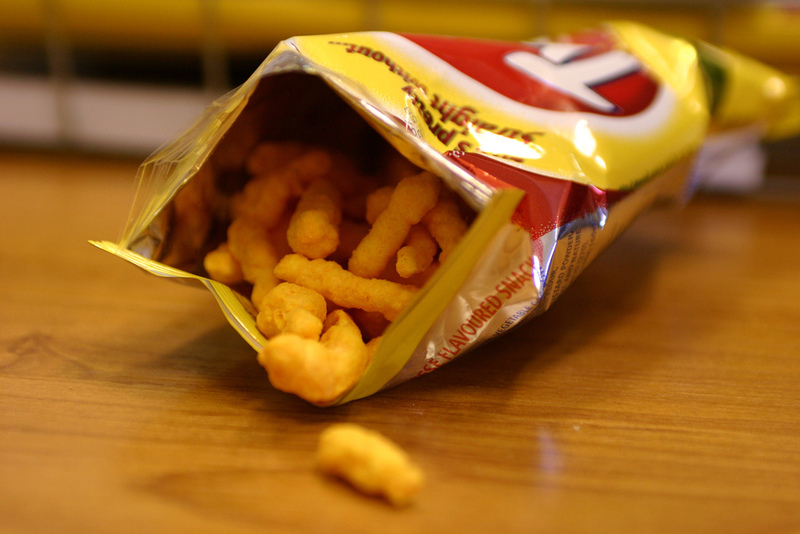 OK, I wasn’t vomiting left right and centre; I instead developed an aversion for almost all foods except beige ones and the occasional bit of green, but could happily munch away on MSG laden snacks which seemed to be the only thing which temporarily reduced the nightmarishly unending nausea. 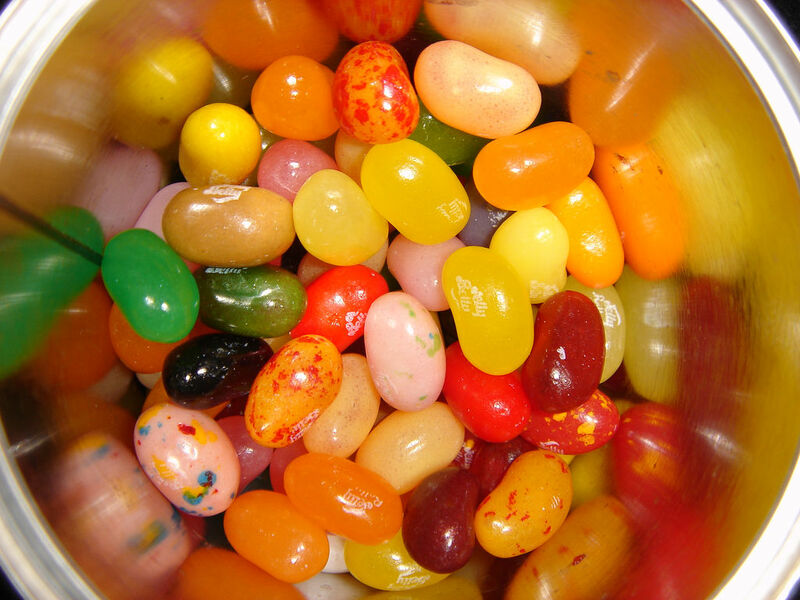 There were exceptions to the beige tendancies; Jelly Belly beans could cure all ills on certain days. My sense of smell was also now off the scale and while everything which had previously smelled good to me was poison, bad smells were suddenly amplified by ten. So someone who had previously prided herself on eating good, healthy (and more recently vegan) food, turned into someone who would eat whatever she could stomach. In short this is where free range eggs and farmers market hard cheeses re-entered my limited diet – but not without a struggle I might add. Before the morning sickness reared its ugly head, I marched off to a dietician who specialised in Vegan/Vegetarian diets for advice on how I could stick to my principles while still nourishing the child taking form within me. The news was good; a few nips, tucks and tweaks and he could see no reason my diet would not provide all the nutrients I needed for the journey ahead. However, when the morning sickness kicked in, I soon realised I would have to eat whatever nutritious foods I could stomach to supplement a fairly lacking and unbalanced diet. So now, it will be a period of re-adjustment and taking stock. We couldn’t grieve for the loss of a baby as he or she had left the building (so to speak) weeks earlier at the size of a mere dot. We had however, fallen in love with the idea of what could be and the amazing ride we would embark upon which would change our lives in all kinds of ways forever more. Let’s see what it has in store for us next. 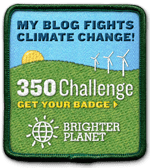 Vegan Challenge wrap up: It’s easy being green! Well, time sure flies when you’re having fun! I have now officially been a vegan for 31 days. They say it takes around 3 weeks to form a habit and judging by how normal it feels to be eating this way now, I would have to agree. The thought of eating eggs and dairy is now quite strange and I have done so well without these foods that re-introducing them seems somewhat pointless. Realising that a lot’s changed in the past 15 years since I was last a vegetarian – there are so many more options in terms of good quality natural products to supplement my diet and a wide range of vegetarian options at regular restaurants, as well as a growing number dedicated to a vegetarian menu; gone are the days of being served up a bowl of steamed veggies with a cheese sauce on top! Learning to be more inquisitive about exactly what is in that can of soup I pick up at the supermarket or in that “vegetarian” pasta at a restaurant. Feeling less bloated and having more energy in general despite having a few minor ailments this month. I even managed to drop a couple of unwanted kilos along the way. Bonus! 2. Microwave the chocolate then stir the oil into the melted chocolate. 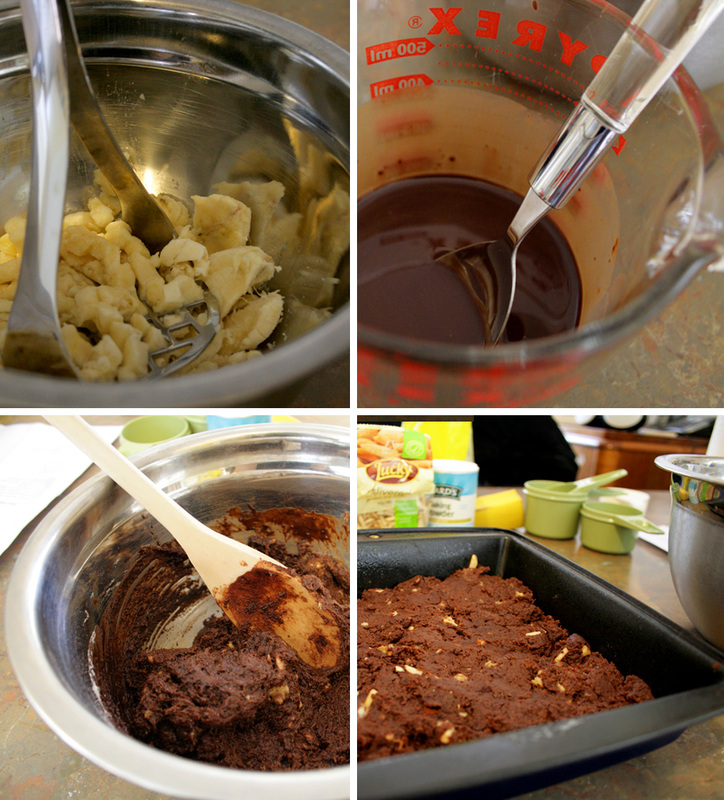 Pour chocolate mixture into a mixing bowl and add remaining ingredients. 3. 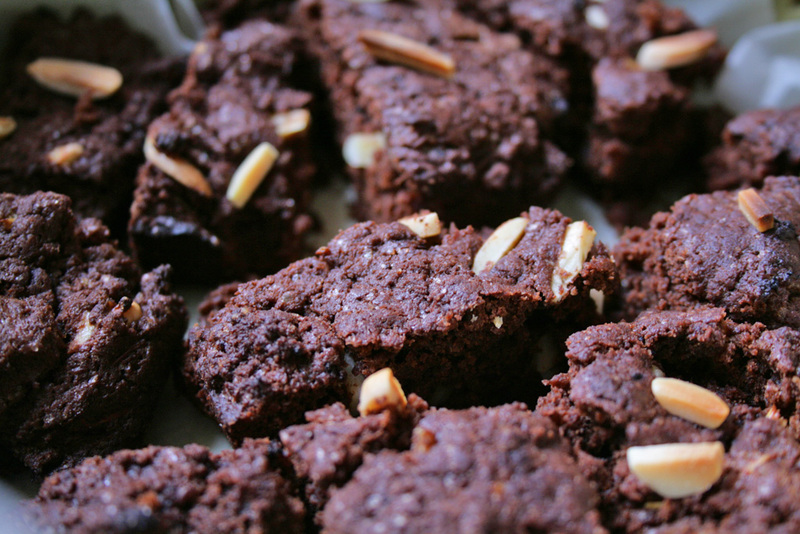 Spoon the brownie mix into a greased pan and top with almonds (I used a fairly small square cake tin for this). 4. 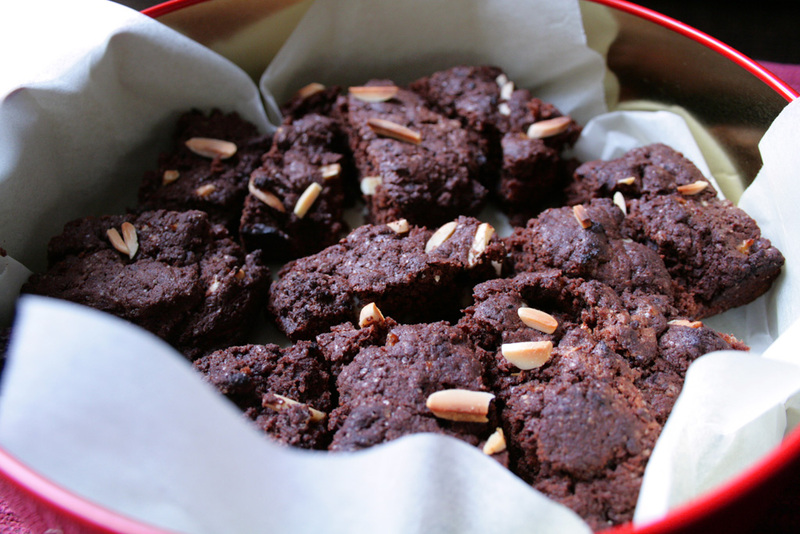 Bake them for 15 minutes, until a cake tester or toothpick comes out clean when inserted into cake. Be careful not to over-bake them because they’ll be dry and flaky. 5. Allow to cool before removing from tin, slicing up and serving.